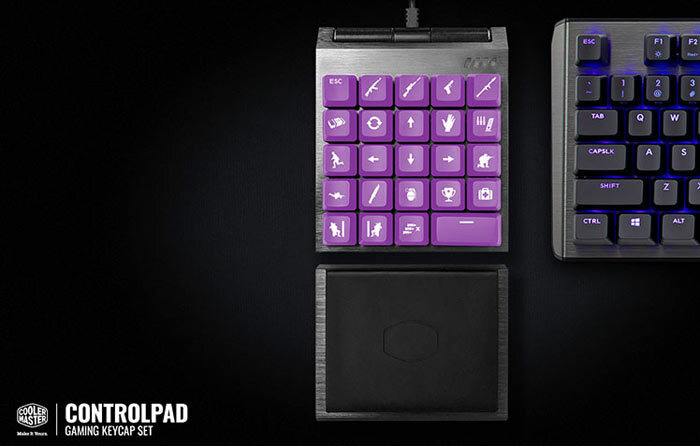 Cooler Master has launched an interesting new numeric keypad accessory on Kickstarter. The device is dubbed the ControlPad and it delivers 24 mechanical keys (choose either Cherry MX Red or Gateron Red), two precision scroll wheels up top, and is fully RGB backlit. A matching removable wrist rest is pictured next to the ControlPad in many of the promotional photos. The ControlPad is claimed to be “a passion project from the ground up” and the most interesting thing about the keypad is that provides analogue control. Each of the 24 keys is pressure sensitive. In practice that means each key can detect the gradual pressure being applied and translate that into onscreen action or control. For example, in gaming, the key assigned for forward movement can have slight pressure applied to follow behind a slow moving NPC without stopping and starting, or you push the ‘pedal to the metal’ to move forward swiftly. 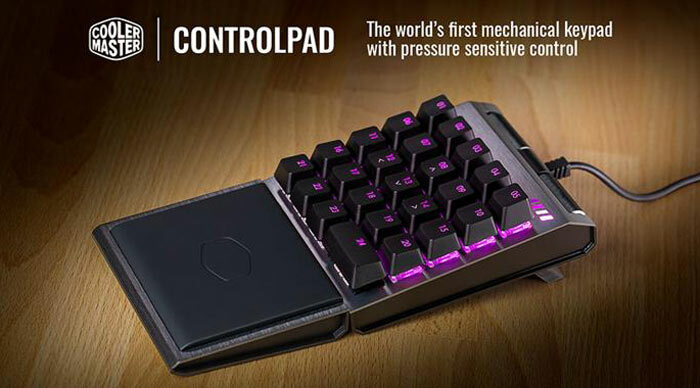 Cooler Master doesn’t want to limit its ControlPad appeal to gamers and says it is also a very useful accessory for content creators, musicians, and medical. We have seen a full mechanical analogue keyboard on Kickstarter before. Back in the summer of 2016 we noted that the Wooting One was successfully funded, and that device has since been succeeded by the Two. Cooler Master gives you a taste of this technology, and perhaps all you need on a dedicated accessory with its 24 configurable keys. 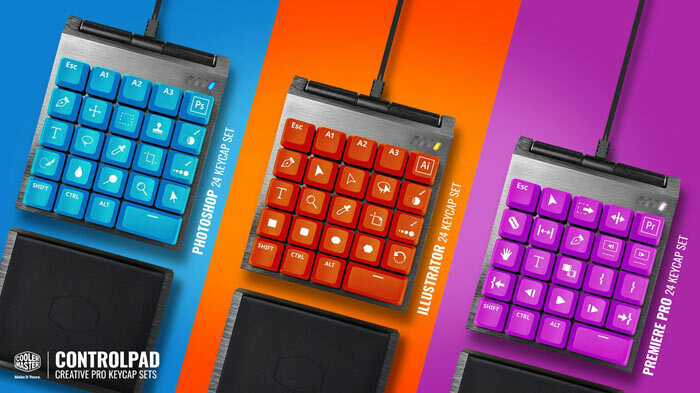 With this in mind Cooler Master is promoting ‘dedicated keycap sets’, stylised with different colours and symbols for games genres and apps (sets for controlling various tools, actions and so on in Photoshop, Illustrator or Premiere). If Cooler Master’s ControlPad sounds interesting to you, an attractive entry level is the Gateron Early Bird price of $55. For this sum you will be offered the ControlPad (Gateron Red switches), a keycap puller, an exclusive ‘goodie pack,’ and your choice of one extra keycap set. Cooler Master only emailed HEXUS about this project yesterday evening and it is up and running and one third funded with 44 days to go, at the time of writing. Still really bothers me when fully functional, globally shipping, profitable companies “need” crowdfunding to make a product. I don't think it is a matter of need, more one of reducing financial risk and seeing if the idea may be popular. This is what marketing departments are for, surely? They don't just do the marketing, they also do the market research for new products. This, what I'm typing right here, is ‘the world’s first' internet post in which a Ttaskmaster has used the word ‘Cattywampus’…… Doesn't mean it's any good. They should, yes…. and the idea of KickStarter is that, because enough people pledge money to a product, that is sufficient evidence that it's a worthy investment in what will be a successful product. It's more evidence-based that previous market research, which has sometimes gone horribly wrong and only became apparrent after the company had spent loads of money bringing the endeavour to market. The London Dungeon's “Dead Prostitute” adverts. While I like the idea… I think it would work better with ‘displays’ under the keys so they can be changed according to the app, bit like the art lebedev optimus aux keyboard , rather than needing to change key caps all the time. It's also not really a ‘new’ idea, art lebedev came out with theirs back in 2008 and belkin/razor have had the nostromo out for years.